ANNAPOLIS, Md. — With fireworks exploding into the seaside air, the Maple Leafs walked to their rink atop an aircraft carrier with “Highway to the Danger Zone” thundering throughout Navy-Marine Corps Memorial Stadium. On the big stage, the Washington Capitals’ stars delivered, but the Toronto Maple Leafs sorely missed their Top Gun. Alex Ovechkin scored his 598th goal and Nicklas Backstrom collected three points in the first period alone to power the Capitals to a 5-2 win over the Leafs in the 2018 Stadium Series at the United States Naval Academy. Saturday night marked Toronto’s first loss in an NHL outdoor game (2-1). More importantly, the Maple Leafs fell to 2-5-2 in their last nine games without Auston Matthews. Matthews’ absence was hard to overlook - his image was plastered on apparel and part of the pregame montage as perhaps the most prominent American-born superstar on the rise. An otherwise impressive show was overshadowed by a 16-minute delay midway through the third period because of a power failure. Banks of stadium lights abruptly went dark as teams prepared to switch ends to even out any advantage because of the wind. The night was further marred when NBC, the U.S. television rightsholder, cut away from what was supposed to be a NHL marquee event with four minutes left in regulation for local news and Saturday Night Live. “The lights going out, that was probably the most entertaining part,” Nazem Kadri said, perfectly describing the Leafs’ night. Babcock was even more direct. His words were as critical as he’s been about the Maple Leafs all season. Perhaps Babcock wanted to sound the alarm to prevent complacency from setting in. The Leafs have talked about guarding against that since they’re in such a comfortable playoff spot. The way this season has gone - great first quarter, followed by a prolonged lull, then the best third quarter in the NHL - an ebb now would follow the trend. The Maple Leafs have now lost three straight games (0-1-2) for the first time since mid-January. Kadri didn’t seem as concerned. That this was the NHL’s first outdoor game played without the teams at least testing the conditions before the game may have affected the outcome - at least with regard to goaltender Frederik Andersen. Andersen said Friday he would’ve preferred a practice or morning skate to adjust to the different sightlines for his second career outdoor game. He had no such luck. Andersen was pulled for the first time this season due to performance when he allowed five goals on 25 shots. 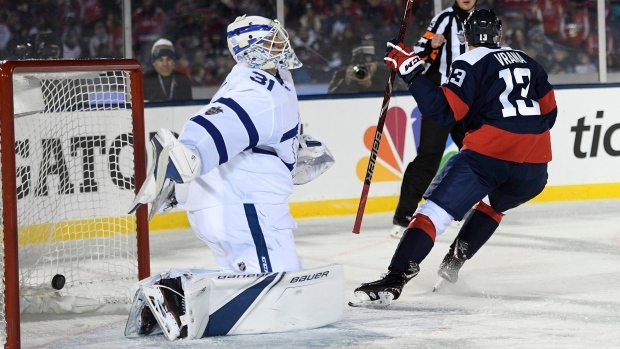 The Capitals didn’t solve Curtis McElhinney in relief. For Andersen, Saturday night marked the second time he allowed five or more goals in a span of two weeks, with the last occurring on Feb. 17 in Pittsburgh. This game will be one that Babcock is thinking about for a while. The NHL nestled into cozy Annapolis for its 25th regular season outdoor game as a salute to the military. Midshipmen marched along and “held the rails” of the NHL’s makeshift aircraft carrier, which surrounded the ice, and housed a fighter jet and buoys to complete the theme. A trio of F-18 Hornets buzzed the 29,516 fans - with the U.S. gold medal-winning women’s hockey and men’s curling teams in attendance - while members of Navy’s hockey teams held the American and Canadian flags for the anthems. High winds which canceled both practice and Saturday’s morning skate outdoors largely subsided in time for puck drop and did not seem to effect play. Game-time temperature hovered at an ideal 5 degrees Celsius (42 F). “Not too bad all things considered,” James van Riemsdyk said of the conditions. Washington scored twice in the first 6:19, including a power play goal in the opening minutes and No. 598 for Ovechkin. He became just the sixth player in NHL history to collect 40 or more goals in at least nine seasons. Those stars were the difference under the bright lights - at least while they were shining.